If you’ve been following along this week, you’ll notice there’s no post for Thursday. That’s because I stayed home sick. I did check a few emails, but mostly I slept or lounged around the house feeling crummy. Not very exciting material to blog about. The highlight was going out in the backyard to refill the squirrel and bird feeders. Granted, I took it slow today so I’m not sure how exciting today was either. I felt well enough to get up and go in to work, but after an hour or two, my energy level dipped and stayed low throughout most of the day. As I was getting ready to write this post I tried recalling my day and realized I did so many little things I couldn’t remember a lot of what I’d done! Thankfully much of it revolves around email, so a quick review of my Sent email folder did a pretty good job of refreshing my memory. My first main task this morning was preparing our STAAR Ready assessment to be converted into Braille. The STAAR Ready is our spring district assessment for grades 3-5. Usually each subject area uses the previous year’s released state test. Unfortunately, Texas did not release the 2015 math tests so we had to put one together ourselves. Using the state test blueprints, we pulled one together for each grade level using sample items released by the state last summer and our own items we wrote for last year’s STAAR Ready. That was quite the ordeal right before and after winter break, and I’ll spare you the specifics. Needless to say, I’m looking forward to using the 2016 released tests next school year! Anyway, back to today, I had to convert the PDF of the 5th grade assessment to a Word document because reproducing the test in Braille, especially the graphics, works much better in Word. Thankfully Adobe Pro makes converting a PDF to Word super easy, but that doesn’t mean the resulting document is flawless. I went through the Word document question by question to ensure text and/or graphics converted correctly. For the most part they did, but every now and then a table or fraction didn’t convert correctly so I had to fix it. General supplies – office supplies, professional books, etc. Since our budget is limited, I have to monitor how we spend our money as well as plan ahead to ensure we can pay for the things we want. For example, bringing in K-5 teachers for a few days in the spring to do curriculum revisions with us is probably our largest expenditure each year, so I have to keep that money untouched for most of the school year. Speaking of money, once I sent off that email, I hopped in the car and drove over to our Purchasing department to pick up my new Purchasing credit card. This is what I use to pay for small expenses such as food if I’m traveling out of town or if I’m at a conference and want to pay for some books. I was supposed to pick up the card back in December, but I’d been so busy I never felt like I could get away to go pick it up. Thankfully I can check that off my to-do list finally! Now that I think a bout it, today was a very financial day for me. Once I got back to the office, I had to do some work with two orders that I recently submitted for the books Beyond Pizzas and Pies and Beyond Invert and Multiply and sets of Cuisenaire rods. All of the materials are going to our campus libraries, so I needed to communicate with them to let them know that the orders are going to be coming in soon. First I had to talk to our Library Coordinator to give her the information so she could create records of the items in our library system. Then I shared a spreadsheet with the campuses where they can log when the orders are received so we can then pay the vendor for the materials. The teachers who attended our fraction PD sessions on Wednesday are chomping at the bit for these materials, so I’m excited that they should be arriving any day now! Before lunch I met with our Director of Response to Intervention to talk about training and support for math intervention. I shared ideas for diagnostic assessments and PD opportunities, including Math Recovery and Kathy Richardson’s Assessing Math Concepts series. It makes me happy that our district has been providing a lot of support to our interventionists last year and this year. I’ve been hearing some great success stories from some of our campuses which makes me even happier! After lunch the entire Teaching & Learning Department (elementary and secondary) met in curriculum work committees. Back in September we took Level I Curriculum Auditing training, and now we’re doing work in committees to take what we learned and do what we can to improve our curriculum processes and materials. My committee is looking at the curriculum writing and review process. We’re looking at it from the perspective of any given year – what does the revision process look like in terms of timeline and tasks. But we are also looking at the cycle over multiple years – what work is done in year 1 of a curriculum, year 2, year 3+? This has been interesting for me because last year was year 1 for the elementary math curriculum. 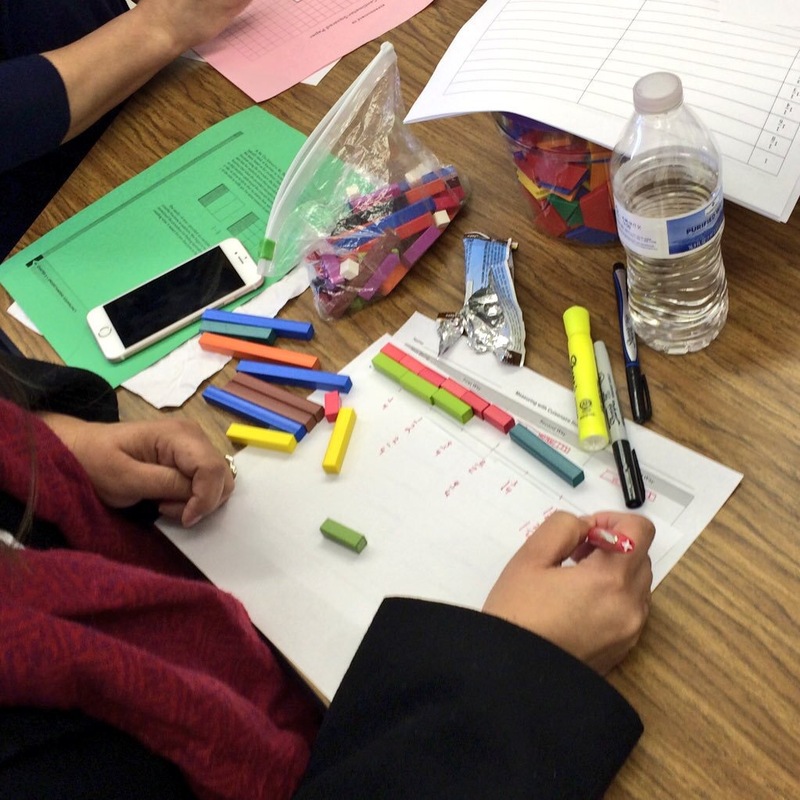 The 2014-15 school year was the first year that teachers taught the new math TEKS, and boy was it a bumpy ride! We learned a lot, and as a result we made pretty significant changes for the 2015-16 school year. Now I have my eye on the revisions for the 2016-17 school year, and it’s interesting to see how I’m able to focus on different things now than I was able to in years 1 and 2. Those first two years were just about getting a handle on it. Now I feel like we’re in a place to refine and improve. It’s a lot of work, but I’m excited to see the curriculum evolving as we go. After our committee meetings, we met as a whole group to share out, provide feedback, and ask questions. There’s a lot of work left to do, but it’s exciting that we’re able to shape our district’s curriculum together as a team. And that wraps up my week! That’s just a taste of what I do day in and day out, but hopefully it provides some insights. If you have any questions, hit me up in the comments. Otherwise, I’m off to enjoy the weekend with my family! This entry was posted in Uncategorized on January 15, 2016 by bstockus. I am without a doubt sick. Yet I was so excited about our fraction PD sessions today that I made myself get out bed and go to work this morning. I’m so glad I did! Both sessions went so well, and I had such a great time working with the grade 3 and 4 teachers today. Being sick, I’m not going to write a lengthy post today because I really just want to curl up on the couch and watch TV. (I already came home and crashed in bed for a few hours.) I took pictures throughout the day so I’ll let those do the talking for me today. How many brown rods long is the marker? If it is 1 brown and 2 reds long, how do we say that as one number in terms of brown rods? 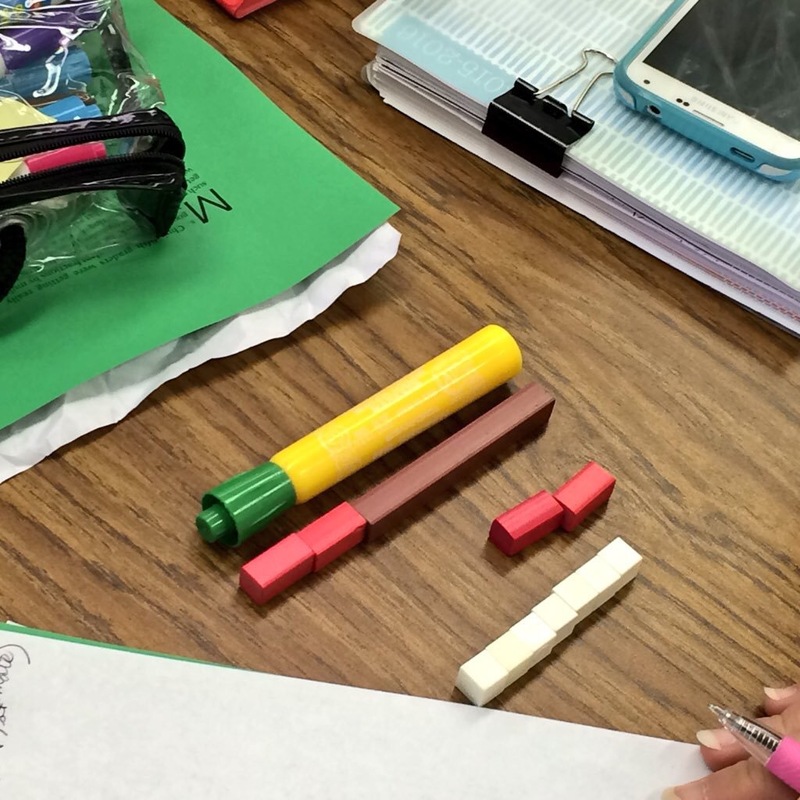 Using Cuisenaire rods to measure on the number line to identify equivalent fractions between 0 and 1. The fourth grade section had a different focus. We focused on relating fraction and decimal notation to build strong connections between the notation systems and what they represent, using multiple representations to build a more robust understanding of fractions and a more versatile repertoire of modeling strategies, and encouraging multiple strategies for comparing fractions to build students’ fraction sense and support later work in fraction computation. I also modified one of the activities from the book. It had the students make a human number line of fraction and decimal values. 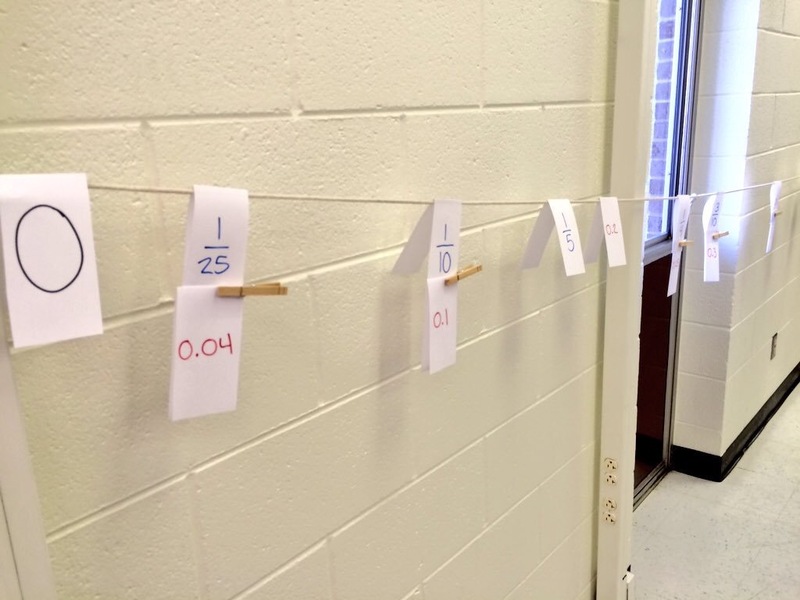 I didn’t like this idea because if students are *in* the number line, that makes it extremely challenging to simultaneously observe the number line as a whole and to see how different values relate to one another. 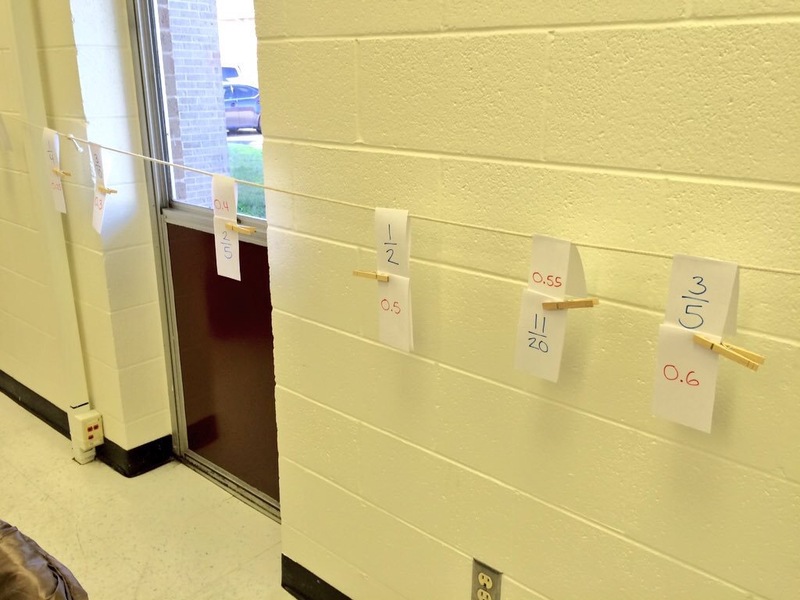 Instead, I did a clothesline number line that allowed teachers to position and reposition numbers as needed. From the session feedback, the teachers loved it! You can’t read the numbers in this picture, but it gives a sense of how much room in which we had to play. We talked about ways to modify this activity. For example, just making a number line of tenths in fraction and decimal form. 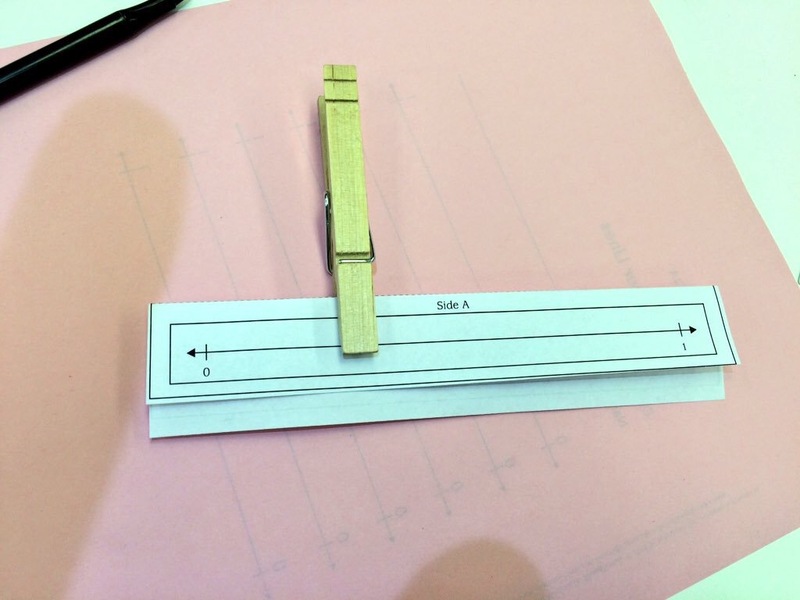 The idea being that you can make a number line any time and in any way you want. What’s important is the thinking and talking as you go and after you’re done. Another favorite activity was Fraction and Decimal Flip. This is great for building some estimation and reasonableness skills. The teacher calls out a fraction or decimal. 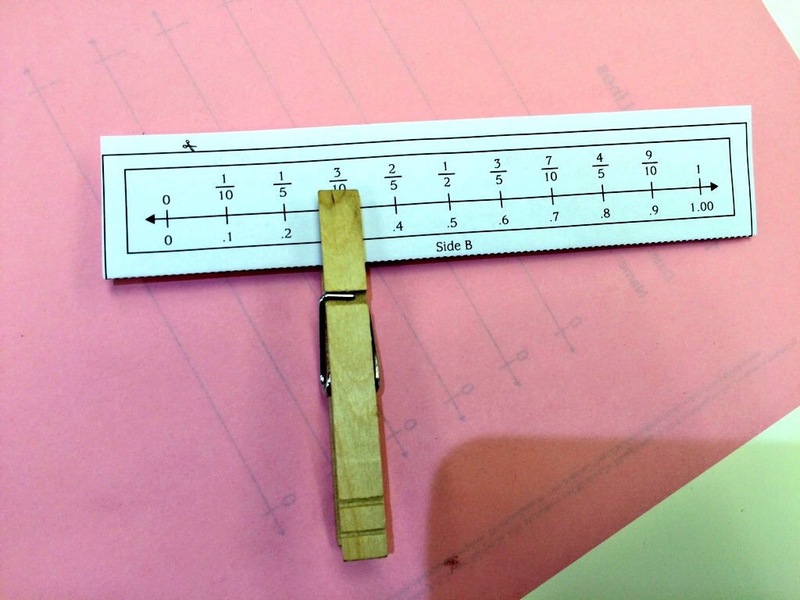 Students clip their clothespin on the blank number line where they think that number is located. On the count of 3, everyone flips their number line to check their accuracy. In a few minutes of practice over several days, students can become more and more accurate in identifying the correct locations of the numbers. I just realized I never snapped any more pictures of the other major sections of the session. Oops! 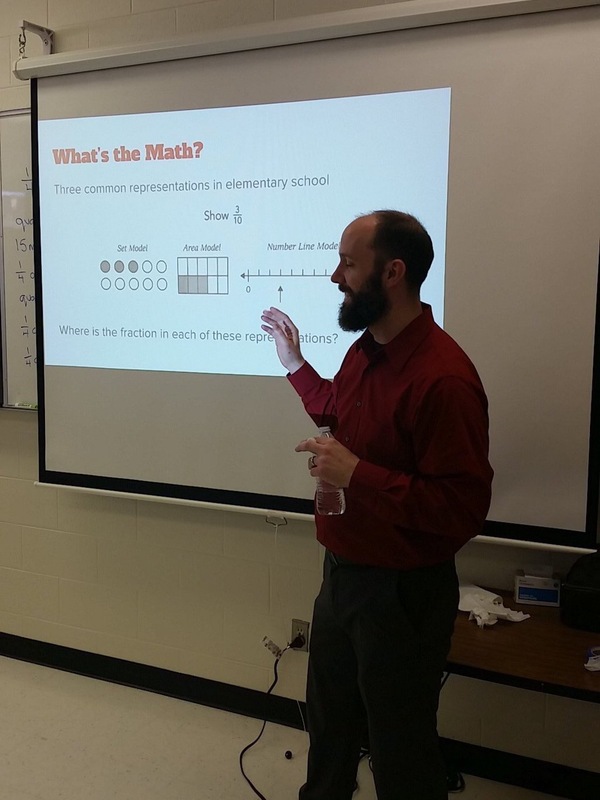 My partner Regina did snap one of me introducing the section on multiple representations. I even managed to have my eyes closed. 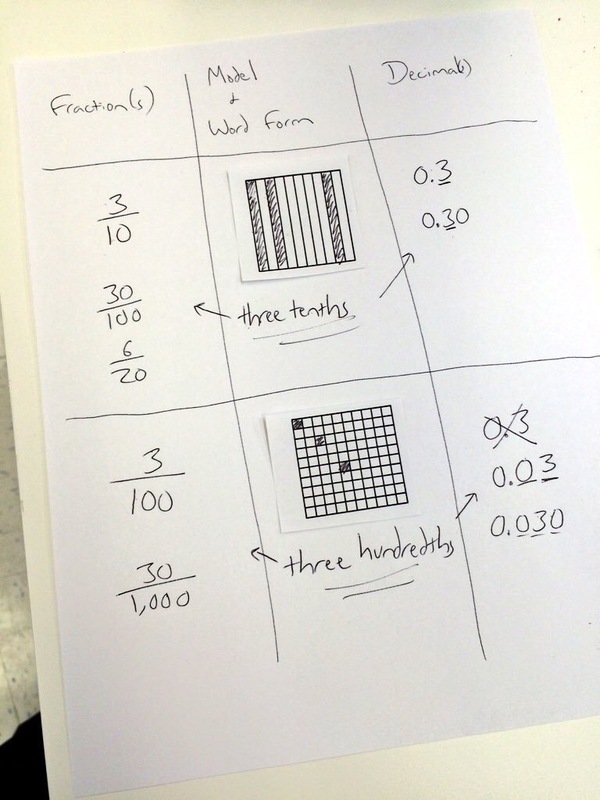 In the final portion of the 4th grade session, we talked about strategies for comparing fractions. I shared two resources that are not from Beyond Pizzas and Pies. I did share the activities from the book, but I wanted to share the extra stuff here since you can’t find it in the book. 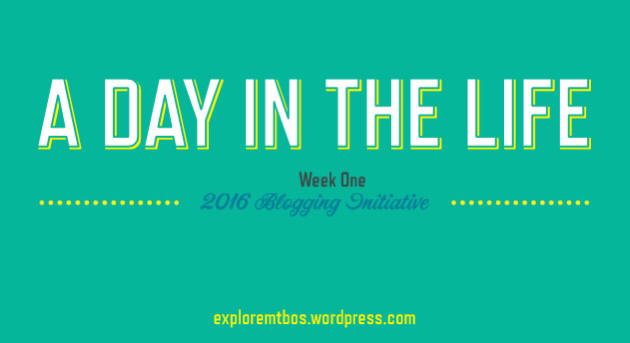 The first is an activity called Fix It that came from a recent blog post by Marilyn Burns. The other resource is three “books” I wrote and shared in a blog post last year. 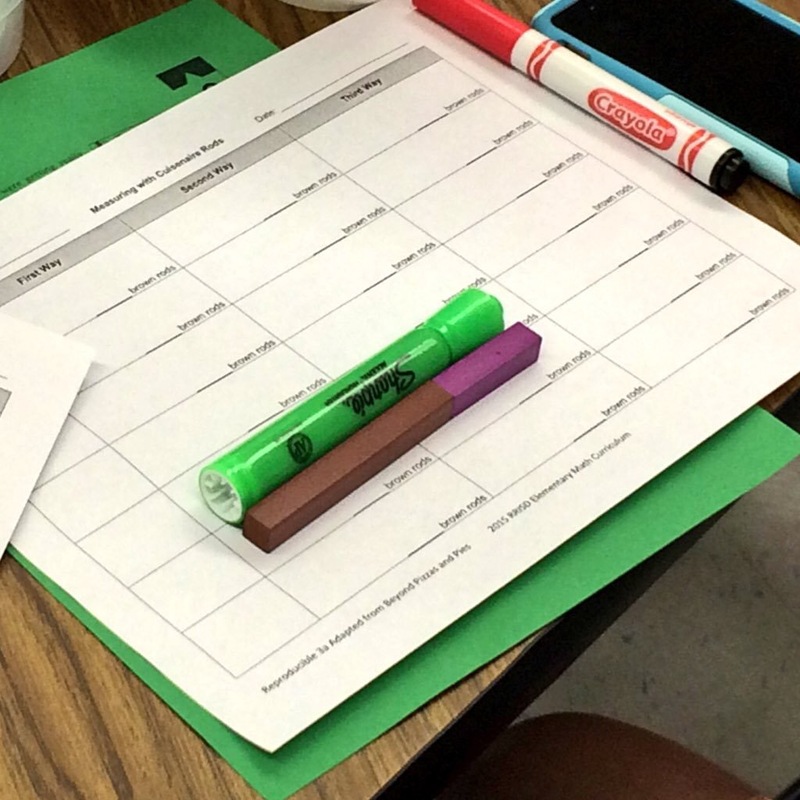 The thought was that teachers could project and use them to help students reason about three comparing fraction strategies: common denominators, common numerators, and comparing to 1/2. I’ve found the books work best when opened in Adobe Acrobat because then you can jump from page to page rather than scrolling from page to page. And that’s a wrap! Copies of the book Beyond Pizzas and Pies should be on campuses in a few short weeks along with class sets of Cuisenaire rods. From the comments and questions we got during our sessions, teachers are excited and ready for them to arrive. I couldn’t ask for better than that! This entry was posted in Uncategorized on January 13, 2016 by bstockus.